People of the renaissance loved their classical references: the name ‘orpharion’ is a combination of Orpheus, legendary Greek musician and poet, who could charm all living things and even stones with his music; and Arion, Greek poet, singer and dancer for Dionysus, the god of wine and fertility. But the origin of the silvery-sounding orpharion was English and Tudor rather than Greek. It was first referred to in print in 1588, 26 or 27 years after the creation of the bandora, to which it was closely related. The orpharion was a hybrid between the shape of the bandora (though the bandora was much larger) and the tuning of the lute, so the orpharion could play lute tablature without any modification. Both instruments were strung were wire, which meant brass for the lower pitches and iron for the upper pitches, the only reliable mass-produced string materials other than gut. The orpharion quickly gained great popularity in England, being the named instrument or noted as an alternative to the lute in 19 out of 63 music books published between 1588 and 1630 where an instrument was specified. 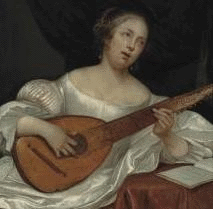 The lute was the most important and popular of all European renaissance instruments, judged by volume of music, esteem and iconography; but in 32 surviving examples of English household inventories between 1565 and 1648, in which musical instruments of any kind were mentioned, bandoras and orpharions were listed as often as lutes. The unusual aspect of the orpharion was its bridge (attached to the body to hold the strings) and nut (which holds the strings in place at the peg end of the neck), which sloped in opposite directions and meant the frets must also be fanned to remain in tune. This enabled a greater pitch range for wire strings, especially at the top and bottom of the range, as the shorter the vibrating length of a string, the higher the pitch; and so the longer the vibrating length, the lower the pitch. It was those wire strings which both enabled the birth and sounded the death-knell of the orpharion. In mid-16th century Germany, Jobst Meuler invented a process for producing wire which would take much higher tension than the then-standard brass, which meant wire could now be produced with more reliability and a much wider range of pitch, thus paving the way for the bandora and then the orpharion. His wire was so superior, in such demand, and his fame so widespread, that the top musicians craved it for their bandoras, orpharions and citterns. Meuler died in 1622 during the Thirty Years' War. Like all string makers of the day, he kept his methods secret so no one else could copy his product. Since no one else’s wire matched his quality and he had died, neither bandora nor orpharion could be effectively re-strung. The instruments continued for another three decades or so, probably while players still had string stock or otherwise were able to put up with inferior strings; and then, sadly, the orpharion and bandora faded from use.